Seated: Sam Presland , James Turner, Patrick Lewis, Alex Turner, Tom Hayward-Cox. 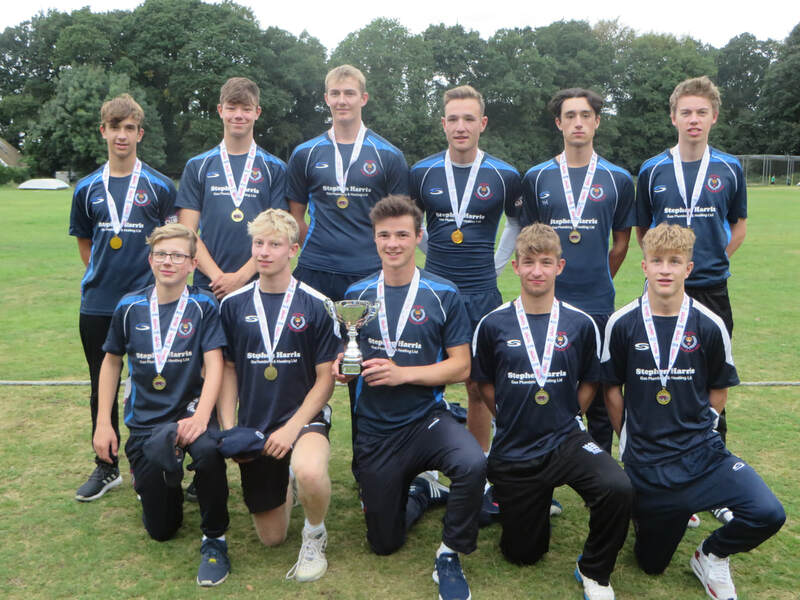 Bashley Rydal’s youngsters overcame a middle-order wobble to beat Hook & Newnham Basics by four wickets and carry off the Hampshire Vitality Under-19 T20 Cup. Having brushed aside Fair Oak in the semi-finals at Calmore’s Loperwood Park, Bashley looked to be cruising to victory at 90-2 chasing down Hook’s 121 all out. But three quick wickets by Will Wyatt (3-19) left Bashley 94-5 – and in a state of panic. Ten runs off the penultimate over lifted Bashley’s score to 117-6 and five wides off the first ball of the last over settled it. Fair Oak 101 (Middleton 28, South 20) Bashley (Rydal) 104-4 (Lewis 32, J Turner 24). Bashley (Rydal) won by six wickets. Portsmouth 125-9 (Wallis 29, Kooner-Evans 22, Shore 4-16, Neville 4-26) Hook & Newnham Basics 127-4 (H Robson 51*, Franklin 26, Hewetson-Brown 19*). Hook & Newnham Basics won by six wickets. Hook & Newnham Basics 121 (H Robson 25, Franklin 19, A Turner 3-1) Bashley (Rydal) 124-6 (A Turner 39, Saunders 22, Wyatt 3-1). Bashley (Rydal) won by four wickets.